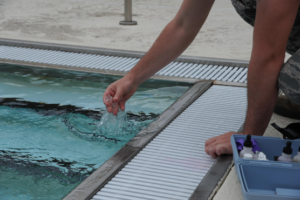 What Are The Key Indicators To Monitor in Pool Chemistry? We often get questions from people about what elements of their pool chemistry they should be testing and how frequently. Ensuring you have your pool chlorinator set up for maximum efficiency is just one piece of the jigsaw. When we talk about balancing your pool chemistry, there are a few vital indicators that you should be regularly monitoring and adjusting for. How often should I check my pool water? What is the perfect pool chemistry water balance? Effective sanitising relies on pH values. Therefore, sanitiser and pH levels should be the measures you check and adjust most often. Remember that there are basically three measures with chlorine: free, combined and total chlorine. The free chlorine level will tell you how much chlorine is available for sanitising your pool. Keeping the pH level of your water balanced at between 7.2 and 7.6 is the ideal target. Check the pH level at the same time as your chlorine levels. Regardless of the chlorine type or the chlorination process used, any pH drift above the recommended range (7.0 to 7.8) will inhibit the sanitising effect of your chlorine. We recommend testing your salt levels regularly, particularly after heavy rain as this will dilute the salt level in the pool. Low T.A. will lead to erosion of the surface of concrete and painted pools. It will also cause the pH levels to be very unstable with small additions of chemicals resulting in major shifts in pH. The Australian Standards recommend a range of 60 to 200 parts per million (ppm). The ideal level for your pool is between 80 and 120 ppm. Monitor your alkalinity once a week as this can influence the stability of your pH levels. Keeping the CYA level to between 20ppm and 50ppm will help to ensure that the free chlorine levels in your pool are well protected from UV light. Test at least once a month in the summer. Without the recommended levels of calcium in a pool, water will try to balance itself by drawing calcium from the walls (in the case of concrete or plaster pools) and from grouting in tiled pools. In Australia the recommended ideal calcium level (ideal) is 100ppm to 300ppm. The only way to reduce calcium harness in your pool if the levels get too high is to add fresh water. Aim to monitor this once a month. If the weather has been particularly extreme i.e. very hot or heavy rain, it’s worth re-testing your pool chemistry and re-balancing as necessary. Keeping your pool water well balanced really isn’t that difficult, especially if you stay on top of regular testing as you should simply need to make smaller adjustments. Balancing your pool chemistry will make for a healthier, more pleasant swimming experience and reduce the risk of common problems such as sore eyes from too much chlorine or algae blooms when your chlorine falls too low.